Colonia for http://needleworkersdelight.com/ where we me Kevin & Alison, the owners who are getting ready to celebrate their 1-year anniversary. The variety of canvases and fabrics is impressive as is the pre-finished items (towels/blankets/tablecloths). There is more cross stitch/samplers than needlepoint. I forgot to look at threads but I thought I saw Anchor and the website says they have Presencia Finca Collection & Jar Designs hand-dyed floss and perle cotton (I wish I’d looked at them). 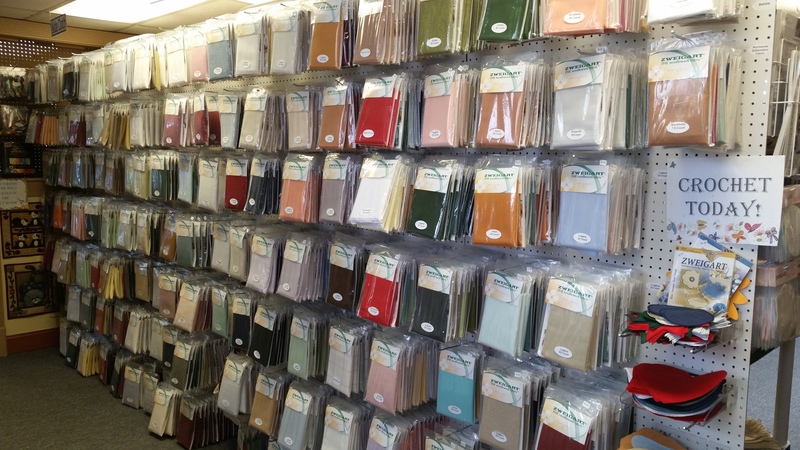 I had no problem finding some interesting items including some Vintage canvas (they have a little tea staining effect which I’ll use for Laura Perin Secret Garden collages which has some open spaces)! 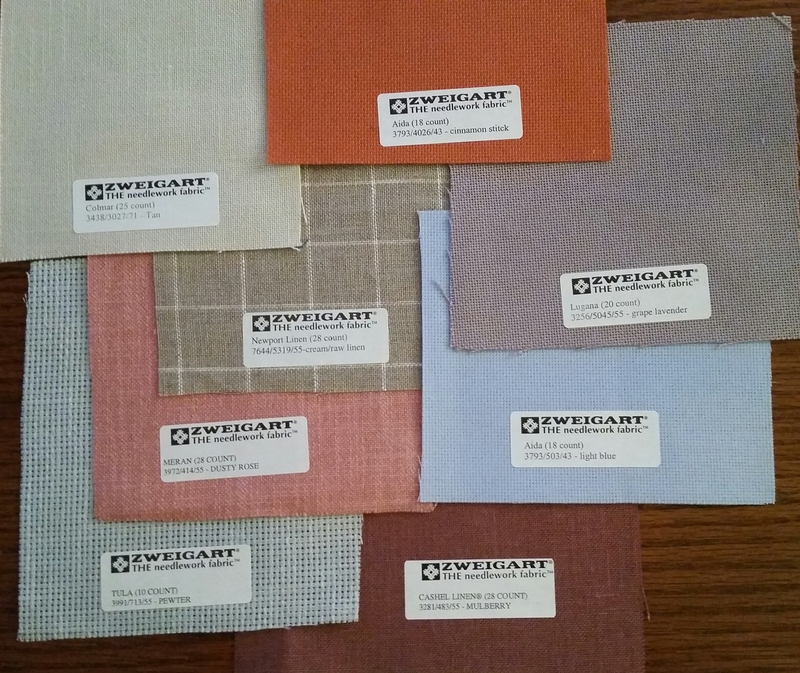 The collection of 8 fabric samples pictured below was a thank you gift for first-time visitors. 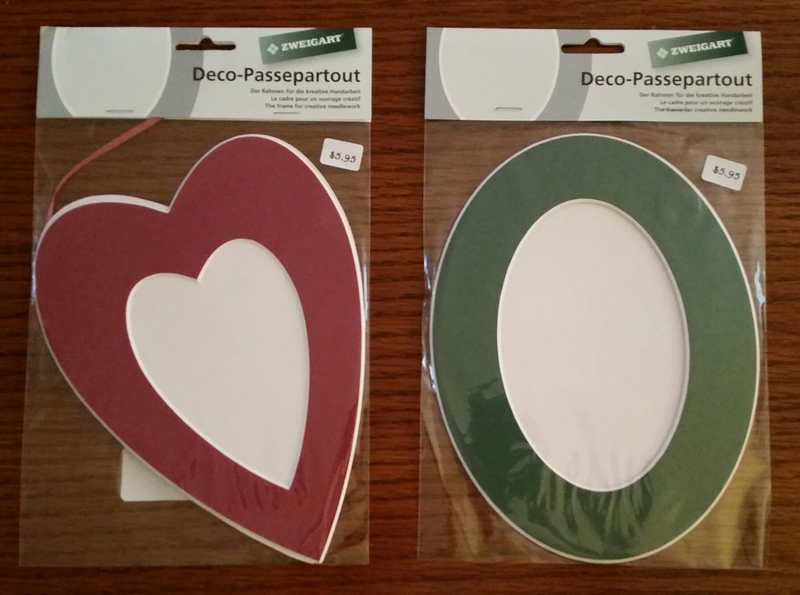 I’m not sure what I’ll use the heart & oval frame for yet but I love that they are self finishing! 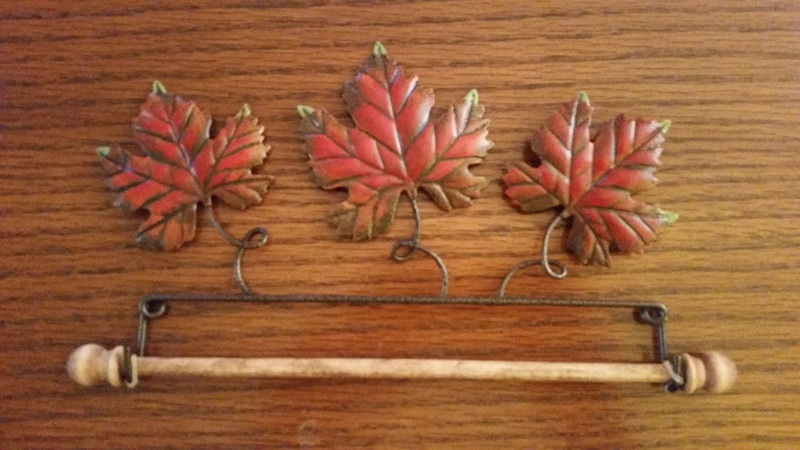 And, the leaf wire hanger was too cute to pass up. We wished Kevin & Alison the best of luck & headed onward! Wyckoff for http://www.ridgewoodneedlepoint.com/ where we chatted more than shopped with a lovely group of ladies who were there for a “Stitch & Sit” (& a few who we saw the next day at New Jersey Needle Festival aka NJNF). 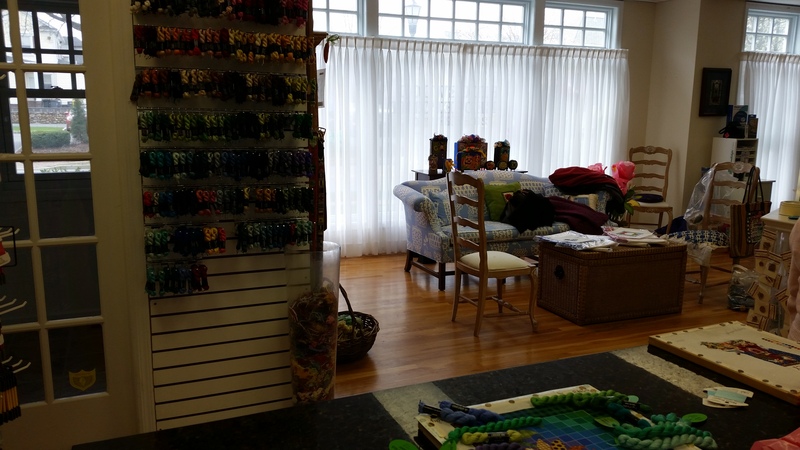 The store has wonderful light (making photos difficult) & several areas to sit & stitch! Fairfield for http://www.theedwardianneedle.com/ where we talked with Tony briefly before he had to leave but Pam & the other ladies were wonderful. We managed to shop more than chat with another group of women who were there for a stitch & chat session. A few of them were headed to NJNF too. They were kind enough to ask if we wanted to join them for lunch but we’d already eaten & so we spent time shopping. 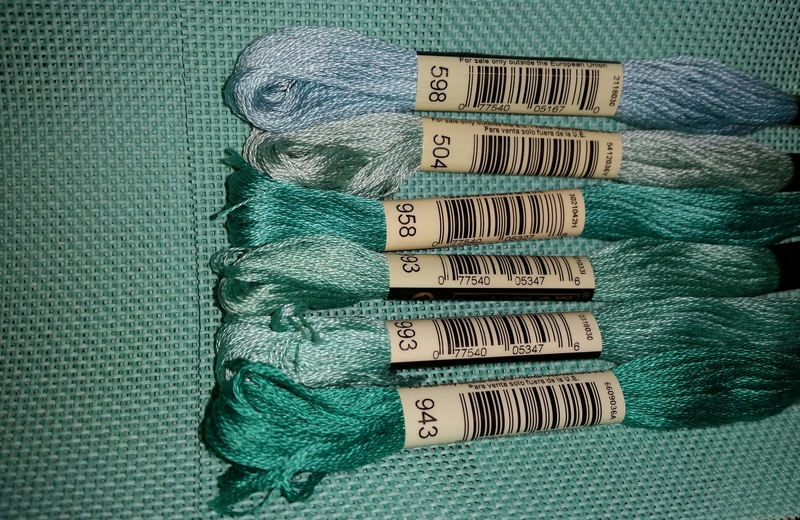 I needed threads for a project I am designing & they have threads!! 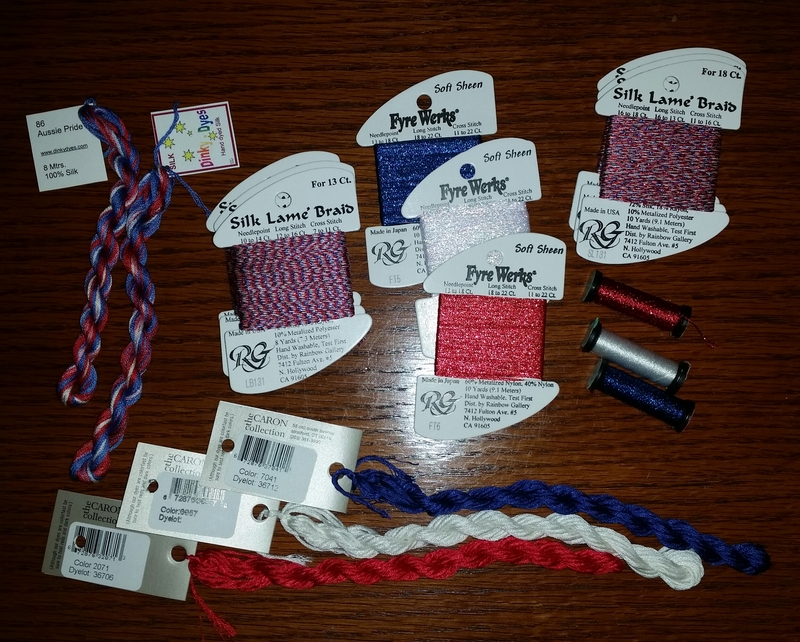 I really lucked out finding the red, white, & blue Silk Lame Braid (I had to get both weights – for 13 & 18 count – it felt like Christmas & my birthday). The Dinky Dyes came in a nice red, white, & blue overdyed floss. 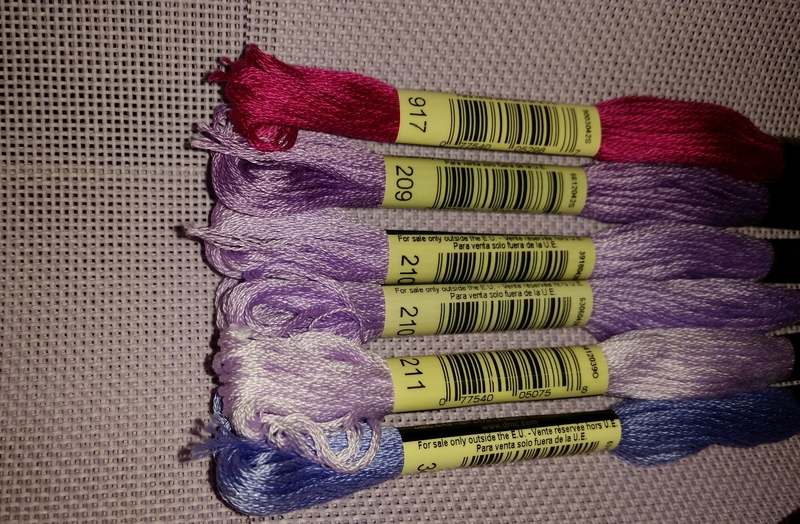 It took more effort than I expected to find matching solids across various thread types for red, white, & blue but selected Frye Werks, Kreinik (red 421, white, 100, blue 033), and Soie Cristale silk threads. and Mendham http://www.mrsstitches.com/ where Ann was busy getting ready for NJNF. We managed to get project organizers before anyone at the NJNF! We were only 10 min behind schedule for meeting Brenda, Ginny, Rona, & Rosie for good food, drinks, and stitching stories at a local restaurant! I forgot to get a picture of the gang – we were too busy talking. What a great day!! The next day was just as much fun. Lori, Linda, myself, Brenda, Naomi, and Elizabeth (from left to right) shared a table together along with more great stories! And, the room was filled with needle crafters of various varieties working on wonderful pieces – so interesting to see everything. I am restitching Gentle Waves but won’t blog about it until after seminar – it is designed in honor of seminar being held in Myrtle Beach this coming September – you can sort of see my design in the picture below (bottom left). 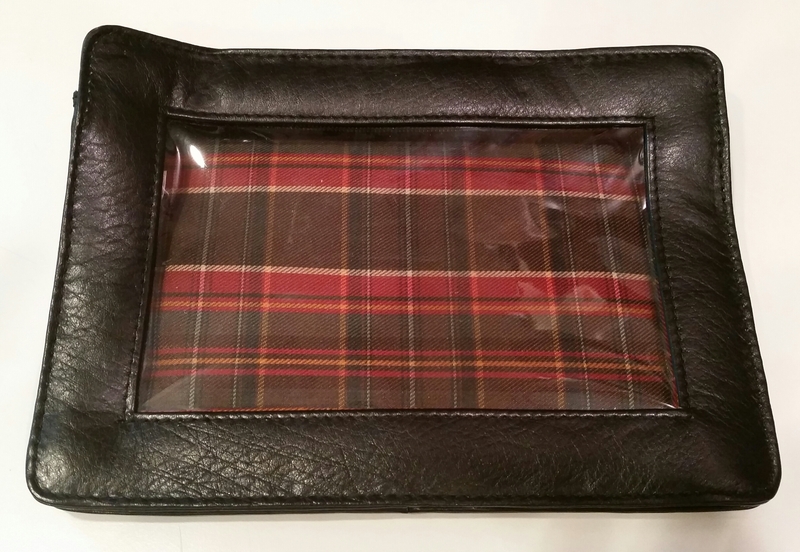 And, there was more shopping with vendors including Susan Hoekstra’s table where I managed to find a leather Stirling bag which I understand is now discontinued. My first attempt at Gentle Waves will go inside the bag. Trish is going to make me a lanyard with 2 hooks instead of single center one. She is a member of my ANG Keystone Garden chapter, Projects VP, and maker of incredible items. 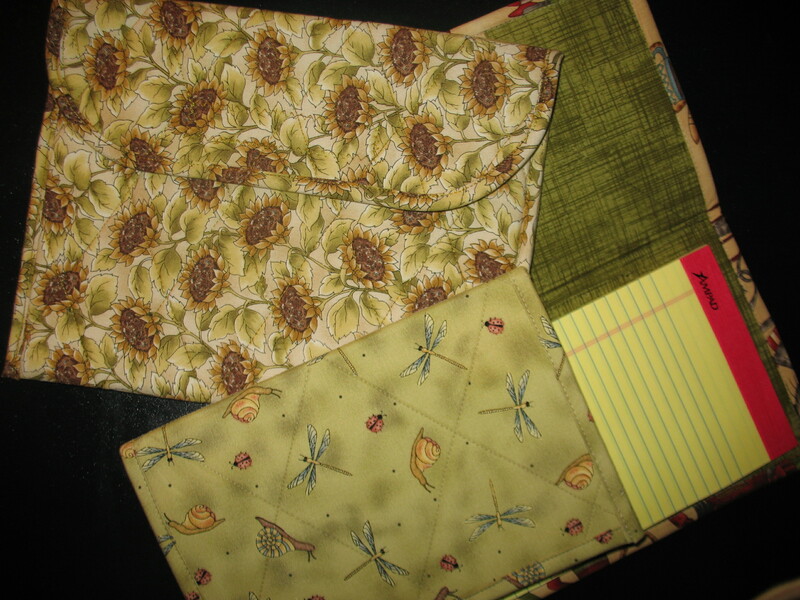 Trish Vine Designs is not on the Web yet but you can email her for a brochure and price list at trishvinedesigns@gmail.com – I have her iPad holder, a notepad holder, & various sizes project bags from past NJNFs. 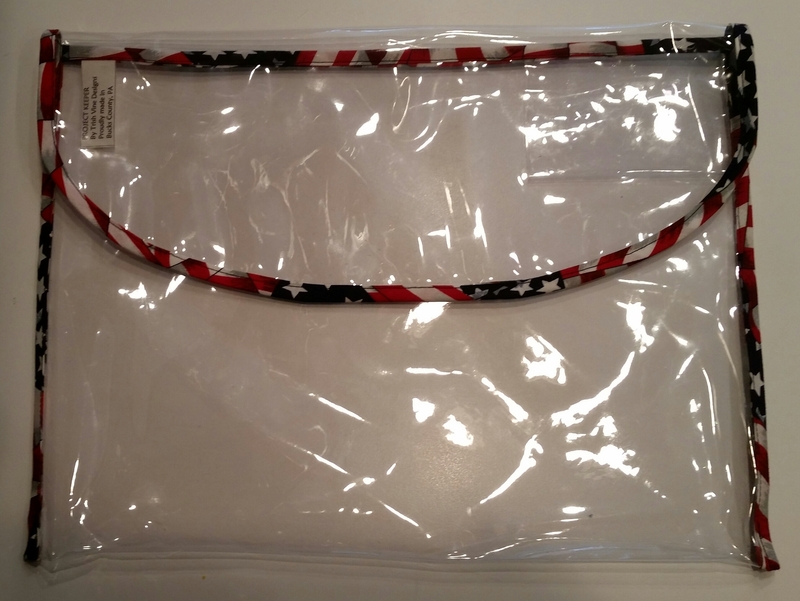 There was one vendor which makes a yarn/thread organizing system (WaterfallThreads.com) with holes along plastic bars that hang in file cabinets. This is her business card! So clever. 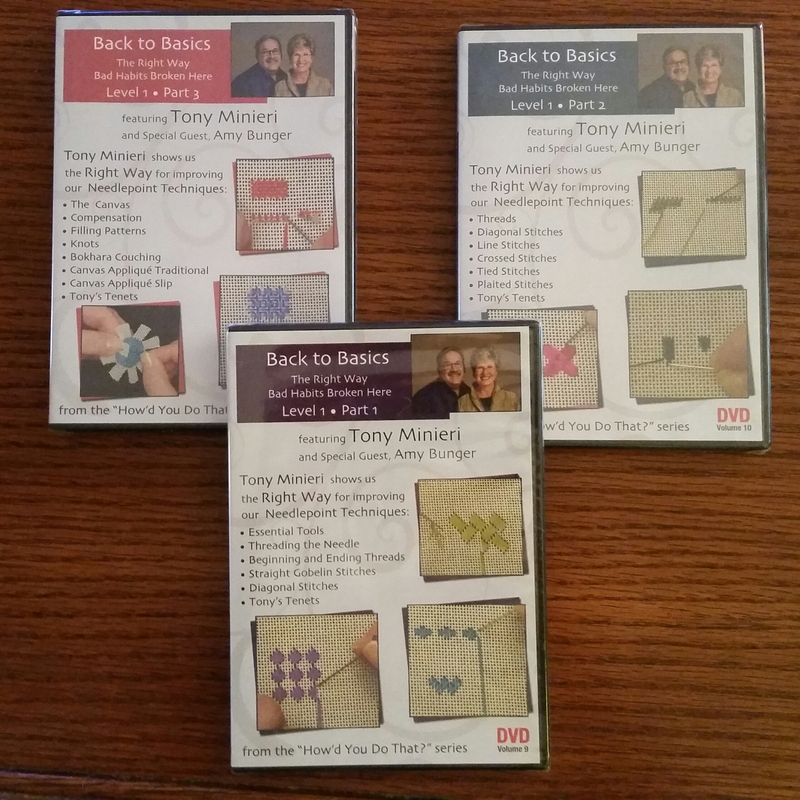 Karen at Nimble Needle must be a mind reader – I wanted Tony Minieri’s Back to Basics DVD series & she had all 3 at her table! This weekend wouldn’t be possible without Susan Hoekstra who hosts the event, including her husband & friends who help make the day such a success! What an incredible amount of work to make something like this go so smoothly & be such fun. 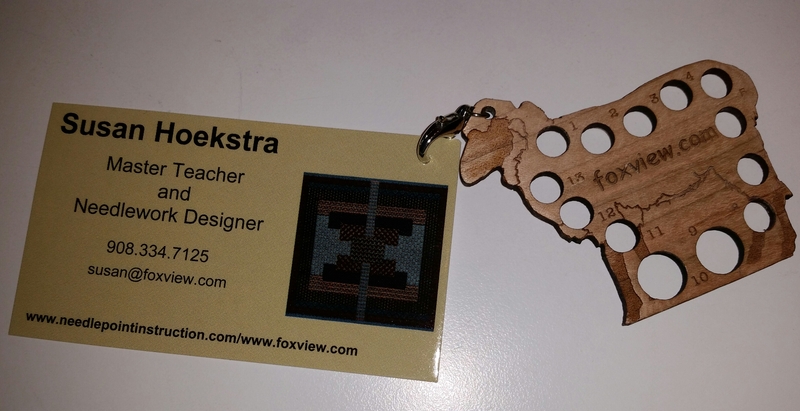 She put a cute gift in our bag from her business (foxview.com). Most of my thanks goes to Linda who is such fun to travel with & then the ladies at dinner, my table mates at NJNF, the store owners we visited & at NJNF, and all the women we met both days! 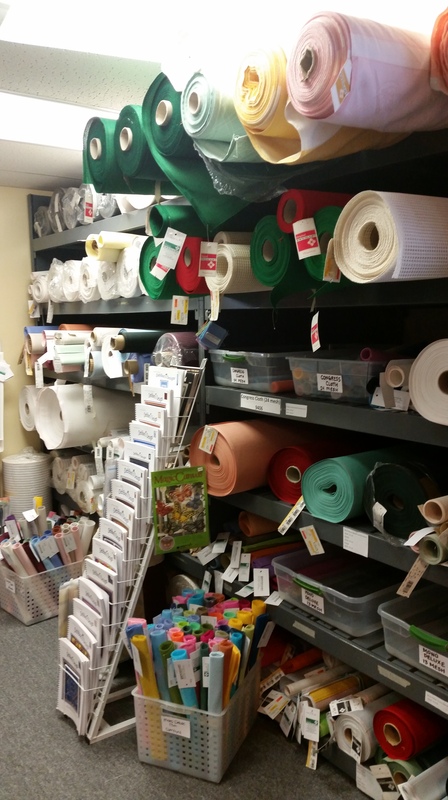 Needlecraft is thriving in NJ!! As Projects Chairman for ANG Main Line Stitchers chapter, I have enjoyed taking information provided by National on our website. This project (http://www.needlepoint.org/Archives/RecoloringYourCanvas/index.php) will allow us to do some stitching during the meeting. No doubt we will finish at home. Perhaps we can donate them to our gift tag project. The project “allows the color of the canvas to optically mix with the threads to create a new color” – I have the 3 colored canvases & matching threads mentioned in the article (by Kathy Holman which was originally published in NeedlePointers in September 1997). I am looking forward to seeing these stitched! I stitched mine but the other ladies haven’t made it back to a chapter meeting yet. 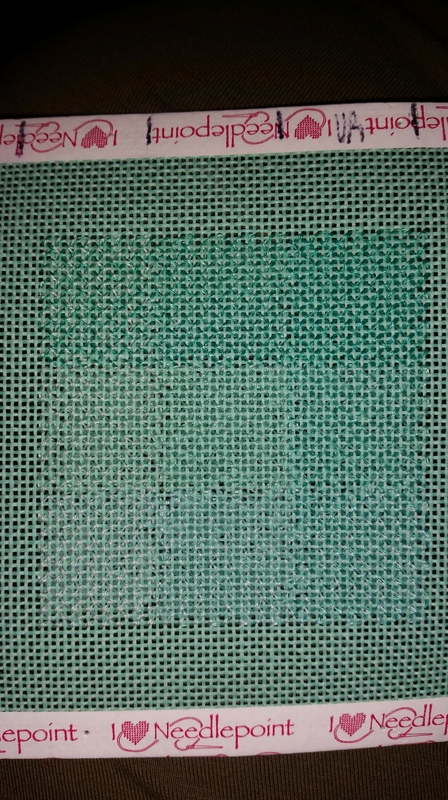 It’s tough to see the color variation in the canvas sections even in person & more so on the blog. 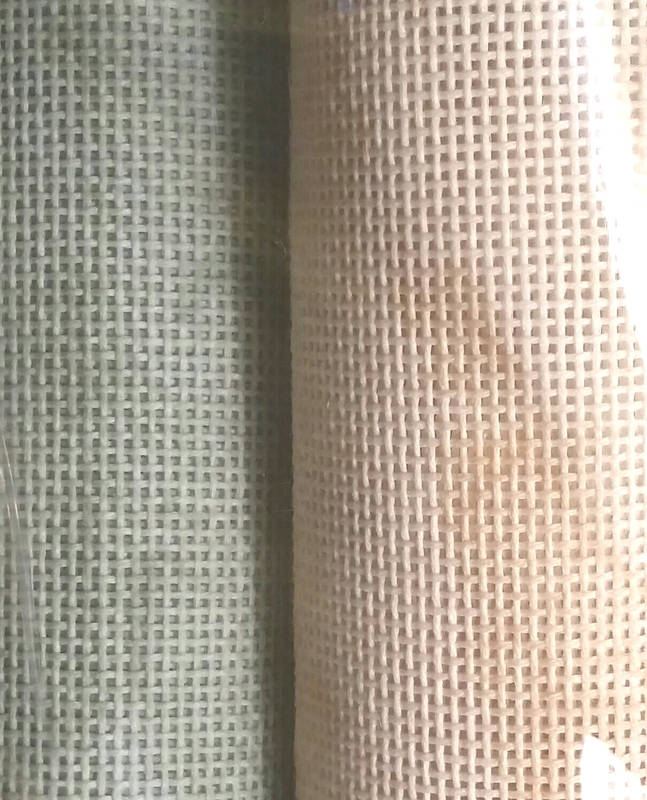 But, I can see differences in the color of the canvas caused by the threads easier in certain sections more than others. 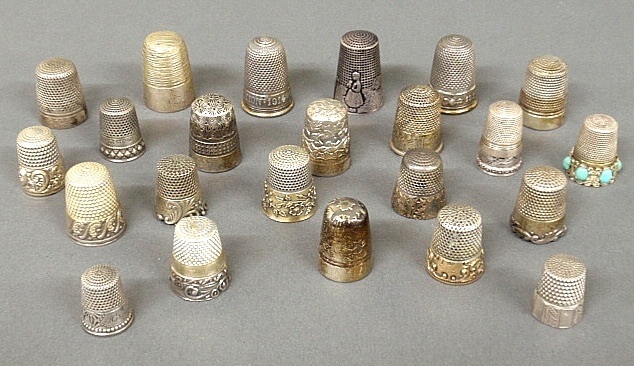 It really is more than just the variations of the thread. 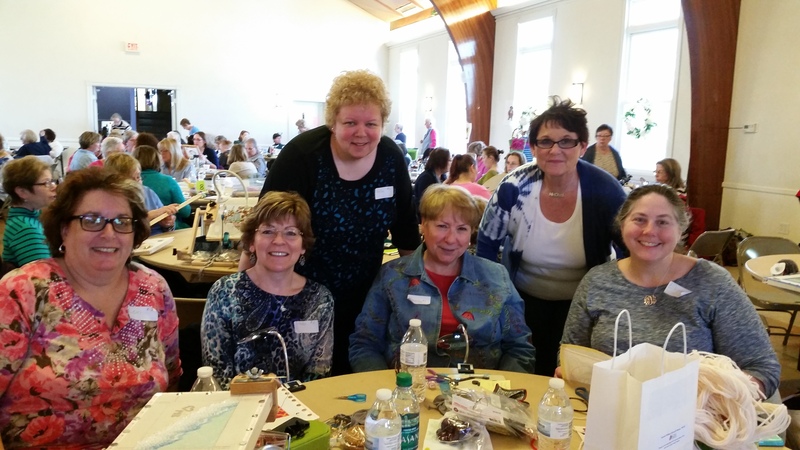 My ANG Main Line Stitchers chapter was fortunate to have Cleo from Busy Lizzy in Chadds Ford visit us. I believe she does more finishing now but has canvas & threads. She is busy working out of her home. So, I think it’s more by appt even though I heard come visit anytime. 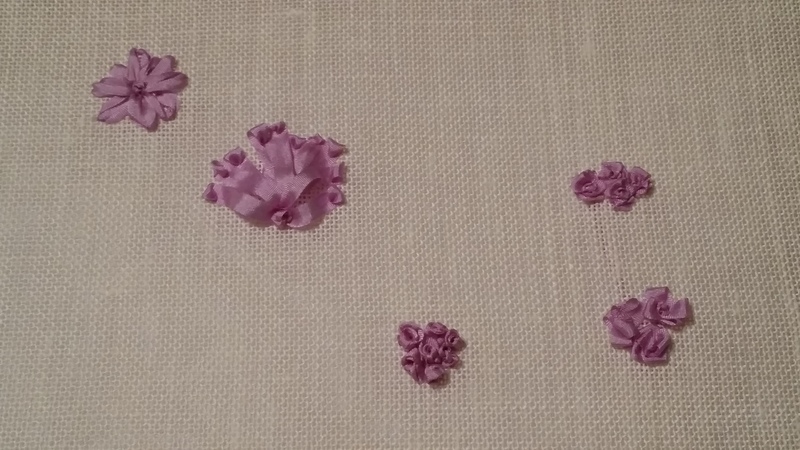 In just an hour and a half, I was feeling pretty good about my ribbon French Knots (done two different ways). And, the lazy daisy was fine (nothing too tricky except playing with the twist). I forget the name of the second to the left flower on the top. That was the hardest because I kept pulling too tight. It was great to learn something new & demystify ribbon embroidery even just a little! Thanks so much to Patrick for driving her. And, to Cleo for donating the cloth & ribbon for 12 of us! 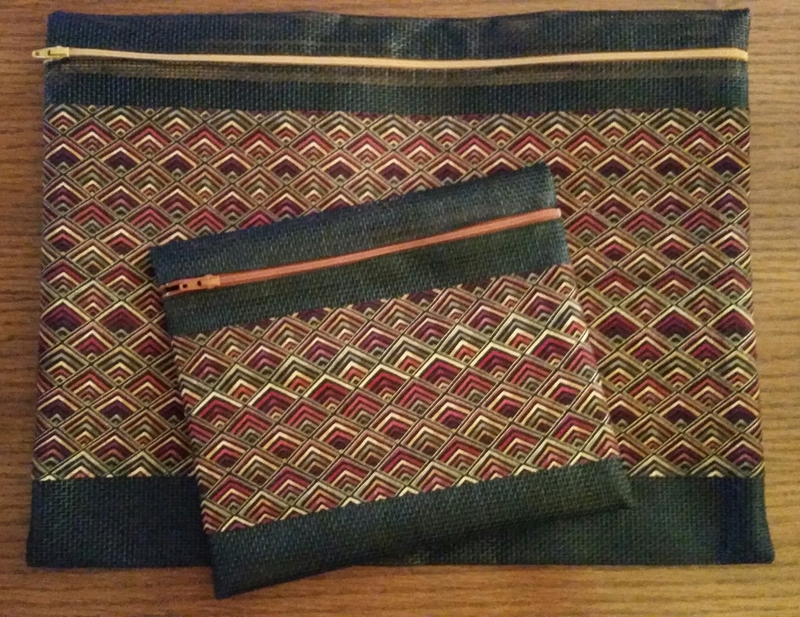 The fourth clue in the Stitching Games 2015 run by stitcherie is 3. Initially, I thought a 3-sided stitch pattern but with the 6-sided shapes in the vase, I didn’t think that would work anywhere. I really wanted to work on the bottom area which is area number 3 when you start with the top area as number 1 and going either clockwise or counter clockwise around the exterior, the bottom is area 3. It doesn’t end there. I tried 3 thread types. First was Pepper Pot Silk (Tendrils 098) which is a great match to the green bamboo in one and two threads in the Florentine and Satin pattern from SuZy’s Portable Stitches. Two was too thick and one not enough coverage. So, I tried Silk & Ivory (Lime 56) which seemed dull somehow but coverage was great. Then, I tried Vineyard Merino (English Ivy M-1197) which was so close to the bamboo color that it would detract from the focal point. 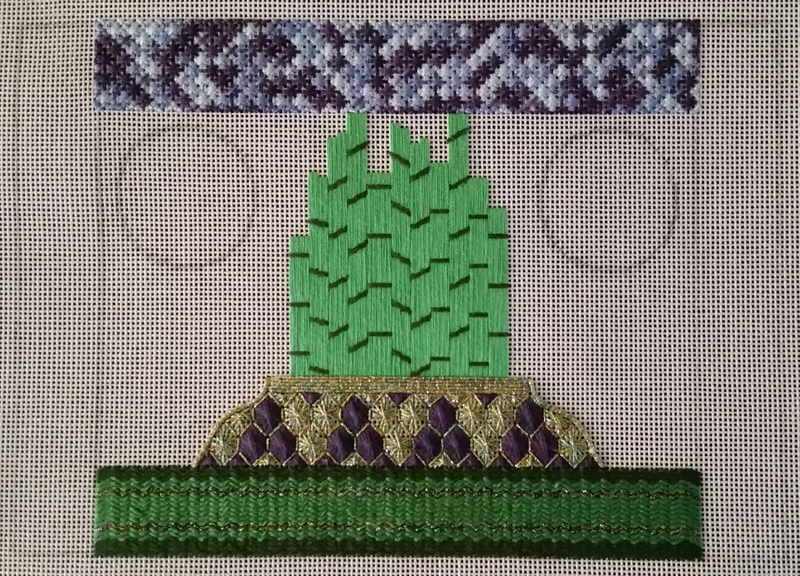 And, by then, I’d stitched enough to see the diamond pattern would conflict with the 6-sided pattern. The 3s saga continues as I searched for a new stitch pattern. The vertical look of Buildong Blocks conflicted with the vertical bamboo. So, I was thinking horizontal pattern as I thumbed through The Needlepoint Book (looking forward to the 3rd revised edition coming out soon; but, I have too many notes in this one to part with it!). Plaited Gobelin is pictured vertically but easily works in either direction. 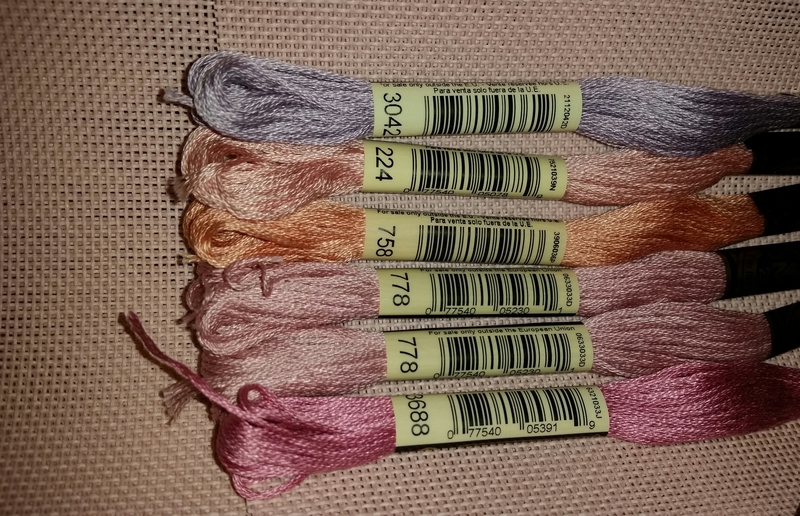 And, I can mix in rows of the dark Mandarin Floss (M914) used in the bamboo and maybe Needle Necessities/Kreinik #12 braid overdyed with greens and purples unless the sparkles conflict with the vase. But, I am happy with my 3rd stitch pattern! The 5th Annual Rehoboth Beach Needlework Exhibit was just as nice as the one I went to 2 years ago. And, Rehoboth Beach is such a pretty area. Linda, from my ANG Main Line Stitchers Chapter, & I went there Sunday after spending Saturday at Woodlawn. I could not take any pictures inside the museum & forgot to take any while we were walking around – it was quite cool & breezy but it was a beautiful, sunny day! We had a great lunch at Louie’s. It was great to see Susan D and Patrick B from my ANG Main Line chapter submit several of their pieces here! Patrick’s scissors ‘Green Block’ got 3rd place in the beadwork category! Several others from their EGA Brandywine chapter submitted blocks as well (maybe when I retire I can handle a dual membership for ANG & EGA). It was fascinating to see some blocks done in beads (creating images of scissors, a threader, and others with light and dark beads), cross stitch, lace ribbons, embroidery patterns, a Penn State theme, cross stitch on padded linen with single thread, or on perforated paper. This is a nice idea for our ANG chapter project next year since we have 2 members who can lead us through the project! Patrick got 3rd place for ‘Sonoma Rose’ (quilt-like pattern of ribbons). Susan got Honorable Mention for her ‘Keep Me’ a house sampler (other smaller motifs with the alphabet, a tree, and a saying surrounded by a decorative border). Best of Show went to Jean T for her ‘Inspiration Sampler’ done with a single thread of floss that had a wider than usual border – very interesting. She won 2 sampler and 2 miniature awards. Several of us from Main Line met Geri W and Roseanne J from the ANG Delaware Seashore chapter when we joined them for a Nancy Cucci piece (one that isn’t done yet). They always enter and do well but how can you not when Geri submitted Nancy Cucci’s ‘Irresistible Iridescents’ (3rd place) or Roseanne’s ‘Summer Surf’ by Nancy Cucci (1st place) – great pieces. Geri also got 2nd place for Crystal Banner and Roseanne for ‘Summer Celebration’ (20 squares each with different red, white, and blue patriotic themes). Roseanne J also stitched the Orna Willis piece ‘The Village I Built’ on 40-count silk gauze with some of the houses in a sparkly thread was very cute. Also in the DE chapter that I met at that class was Brenda C whose ‘Spirit’ by Sue Reed was great in the greens and blues she used. And, it was featured on their advertising brochure (http://brendasneedlepointstudio.blogspot.com/2014/01/needlework-exhibit-2014-in-rehoboth.html). I enjoy seeing mixed media & Kathleen M did several of her family by leaving faces and/or backgrounds of what may be an image placed (not painted) on Aida cloth (scanned from a picture and copied onto the cloth perhaps) and then select parts such as a woman’s jacket stitched or only the boats in a beach scene with the house and sky left unstitched. I don’t believe any other pieces were submitted in this category & she got 5 awards in the category. I got our group to do some mixed media by stitching directly onto pages from a magazine (search Fiber Art on my blog). The ‘Native American Fashion’ by Julie R won 1st place and was stunning – the backs of 4 dresses were placed horizontally across and contained within a series of 3 mats. From inner to outer, there was a thin blue, wider yellow, and an even wider chili pepper red border with triangular cutouts in the corners allowing yellow to show. The frame was a mottled blue with thin red strips near the inner and outer edges. There was a decent representation of quilting (traditional, crazy, and modern) of which I liked best the ‘Blue Heron’ which had part of the beak and tail coming out of the right and left sides – quite unique. Linda C’s ‘Barnyard Animals’ used such a variety of stitches and threads to represent the 8 animals that we (Linda & I) studied this one a long time – interesting! And, Alice F did a fantastic job (2nd place) on her ‘Crab & Shells’ by stitching webbed spider seashells with threads to form 3 distinct bands. Not only was the crab very thickly padded to be raised but so with the bottom of the sea where he was sitting. 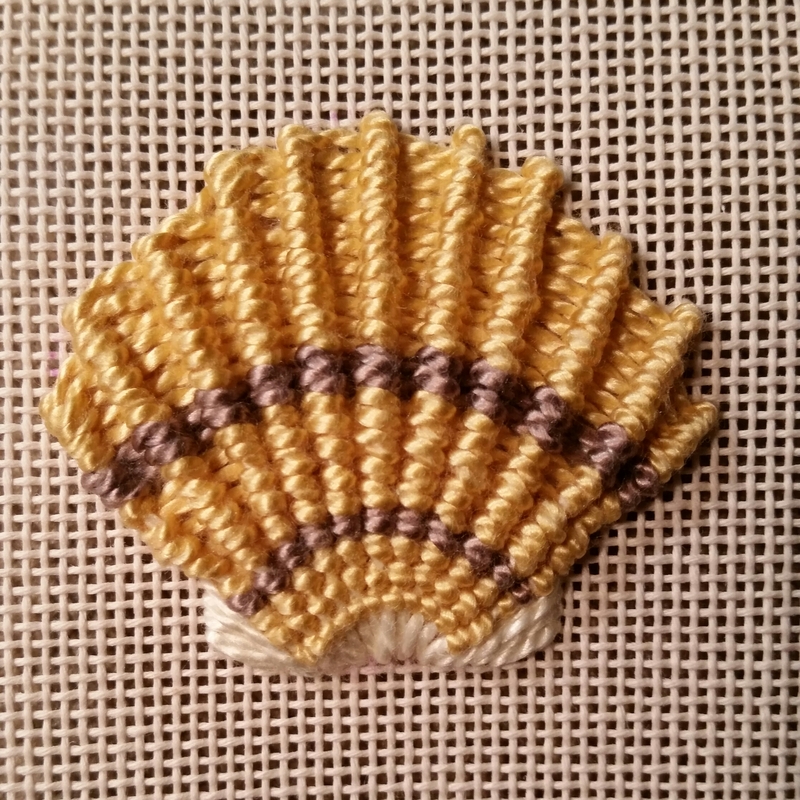 Since I couldn’t take pictures inside, I stitched a seashell to demonstrate what she did. I layed the spokes in the shape of a seashell and used the ridged spider web technique from The Needlepoint Book by Jo Ippolito Christensen. I used DMC #3 (746, 676, & 451) which is a thicker thread & woven looser than Alice’s so that I would finish quickly. 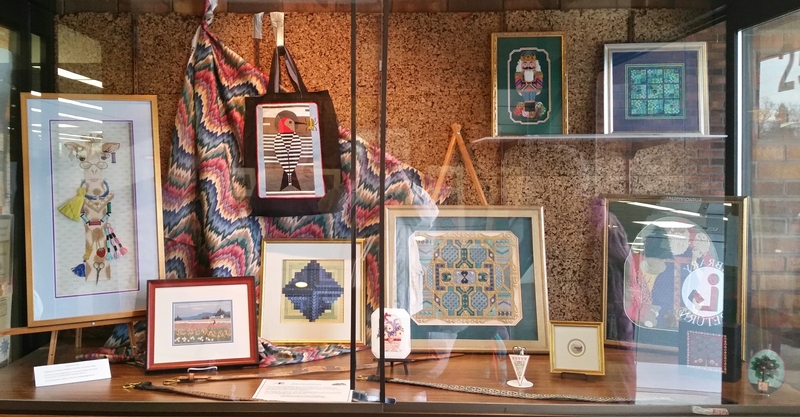 Two needlepoint exhibits in one weekend!! It was such fun looking at these pieces too. My ANG Main Line Stitchers Chapter set up our own exhibit yesterday afternoon in 2 large glass cases in the Marple Township Library which is at 2599 Sproul Rd in Broomall. If you are in the area anytime during the month of April, please stop by – no charge!! No April Fool’s Day joke. And, we’d love to have you join us at St. Luke’s Lutheran Church, on the second Monday of the month at 7:15 pm. GPS: 203 North Valley Forge Road, Devon, PA.